A diverse exhibition featuring mixed techniques, giving visual substance to the interplay between the shared public experiences and the personal interpretations of these realities. The diversity of technique includes contemporary painting in large format and in a series of 10 small works which unify into one rythmatic piece; a storyboard for video art in 15 units, realized in acrylic, pencil and marker on paper mounted on frames; a digital photograph mounted on plastic panel; and 3 works of video art. The public spaces are governed by social convention and the enshrinement of these conventions in law; such conventions and legislations are based on the concept of a generalized common man, however there also exists an individual man who is constantly forced to operate in this social minefield. Such a man may be found in such diverse forms as a terminally ill patient, dying in transit to the hospital, experiencing a moment that no man can truly appreciate, a moment that places the common man into the forced perception of a condensed reality, making him feel his individuality as it and our conventions are swept away by the inescapable reality of impending death; the individual may also be found in the prisoner long sense dead yet having left some trace of his existence in scratched markings in his cold stone cell beneath the ground in some ancient fortress, leaving some evidence of his personal reality while marginalized by empires and eons of rewritten histories; or in the drawings of a mentally handicapped child’s representation of infinity we may see this individual’s existence even as law tries to assimilate her into a broader definition of the common man. In all cases, there exists an uneasy interplay between the attempts of law or society to assimilate or rule these individuals and the reality that their experiences remain consistently outside the understanding of the common man. 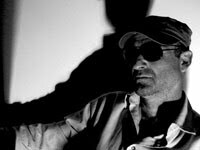 “mixed” attempts to take several examples of the individual’s confrontation with society and translate them in condensed form into a visual presentation more readily accessible to society at large. The diversity of the exhibition allows for variations of taste and understanding while still challenging the spectator to venture farther afield and experience more than he or she would normally given that all is equal. 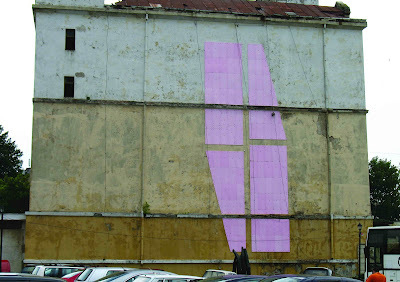 “the physical manifestation, on a public landscape, of a personal space” is the representation of a mentally handicapped child’s personal interpretation of infinity made of Styrofoam panels arranged on a massive scale across the face of a tall building, presented in this exhibition in the form of a digital photograph mounted on plastic panel. 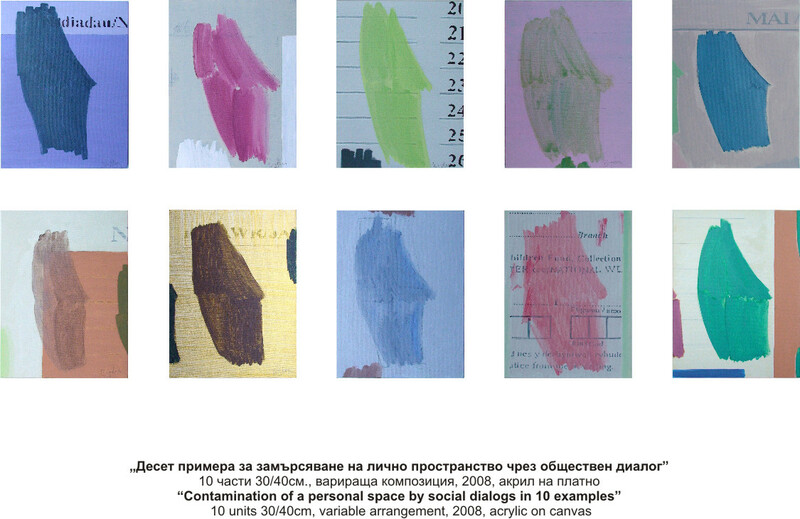 “the contamination of a personal space by social dialogs in 10 examples” is the inversion of “the physical…”, here the child’s drawings are represented in the form of 10 small acrylic paintings, but these have been corrupted by the laws and generalizations of society entering her world by the juxtaposition of legal documents pertaining to the situation of the mentally handicapped in the European Union. “marking time” is a series of 9 small drawings made from stills taken from the video work “time, unmarked”, both works bringing focus to, and interpreting the markings of time left in the dank cells beneath an ancient fortress by inmates destined never to see the light of day again. “instructions for ozone distribution in the European union”, the two paintings present the gulf that exists between her reality and that in which we occupy by reducing that distance and physically uniting their symbolic representations of those selfsame distances. Lastly, “2(pi)R”, portraying the final moments of a terminally ill patient making one last trip to the hospital in an ambulance; the video represents these moments, and suggests the drama and realizations of the patient through the humanization of one of the wheels of the stretcher on which she is laying, as it treks the distance between her apartment and the hospital.